England coach Eddie Jones has warned that a handful of Grand Slam winners are at risk of missing out on the summer tour of Australia. 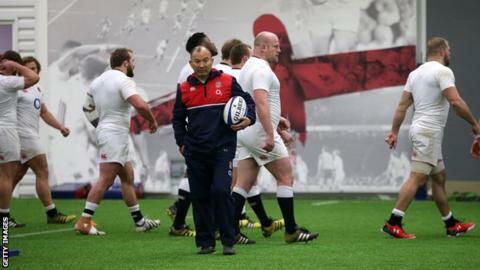 He says some of those involved in the Six Nations win have not played well enough since returning to their clubs. "Personally I've been disappointed in three or four players who have gone back [to their clubs] and played quite poorly," Jones told the BBC. "Those players have put their tour place to Australia in jeopardy." And while some England players have been in good form of late, Jones feels certain individuals have grown complacent since the Grand Slam success. "Some might have little injuries, and some of them have agents or the media in their ear telling them how good they are," he continued. "They have just got too far ahead of themselves." Following the Six Nations clean sweep, England have three teams in the semi-finals of the European Champions Cup, with Wasps, Saracens and Leicester in action next weekend. "We should be happy, but we have also got to be quite aware that we have got to keep improving," Jones said. "Some of the players have been told directly, some of them have been told through other sources. "But they will get the message. We'll see on the rugby field - 80% [are playing well], 20% are not, so there could be 20% change in the tour squad." Jones says Leinster's Worcester-bound centre Ben Te'o is "definitely in contention" for the June tour. The league convert is moving to the Premiership in the summer and qualifies for England through his mother. However, Te'o has to be declared available for selection by the Rugby Football Union, as his contract with the Warriors does not start until 1 July and the RFU does not allow players based outside England to be picked, unless in exceptional circumstances. "He has to be eligible, and that will be decided between the RFU and the clubs," Jones said. "If he is eligible then he is definitely in contention because he's a good player. He can carry through the line, he can pass, he's a good defender." Jones said Te'o has turned down the chance to represent Australia in order to fight for an England place. "He's made a decision to play for England. [Discussions over his eligibility] are moving in the right direction. I haven't met him but I've had a few phone and text conversations with him." Jones also says he is "looking closely" at Ospreys highly rated 19-year-old flanker Sam Underhill, another who may be available for selection through the "exceptional circumstances" clause. England stars at the Olympics? Jones says it is "highly unlikely" any of England's Six Nations regulars will feature in the Great Britain Sevens team at the Olympics in Rio in August. Team GB head coach Simon Amor has stated that any player hopeful of playing in Rio must be available for warm-up tournaments in June, which clash with the summer tours. However, Jones says there is one England squad player who may miss the tour of Australia or the Saxons trip to South Africa in order to chase the Olympics dream. "I have spoken to one player," Jones said. "He was very enthusiastic. It's a back, but we won't go any further than that. "If I think they are a borderline player for us, and there is a great opportunity to play in the Olympics, then I would allow that player to go - if I don't think he is going to play in the Tests against Australia. "The opportunity to represent your country at the Olympics is a fantastic opportunity." The likes of Joe Simpson, Marland Yarde and Semesa Rokoduguni all may fit into this category, with Amor set to name an extended squad of between 20 and 25 players at the start of May. Eddie Jones was talking to the BBC's Sonja McLaughlan. Have you added the new Top Story alerts in the BBC Sport app? Simply head to the menu in the app - and don't forget you can also add alerts for your rugby union team, cricket scores, football and more.